The U15B NJ Stallions 02 Bayern EDP and U16B NJ Stallions 01 EDP teams both were crowned Champions at this year's EDP Easter Showcase. The U15B Bayern team won the top bracket of the Easter Showcase that featured top ranked teams from the region. Bayern defeated the 2nd ranked Virginia team Barca FC Elite 3-1. Followed by a victory over the 4th ranked NJ team Jackson Red Bulls 2-1. Their third victory was over Manalapan Nitro ranked 23rd. They completed the tournament by defeating the 4th ranked Maryland team Pipeline SC in a penalty shootout after coming back from 2-0 down to send the game to PK’s. All in all 4 wins in the top flight. 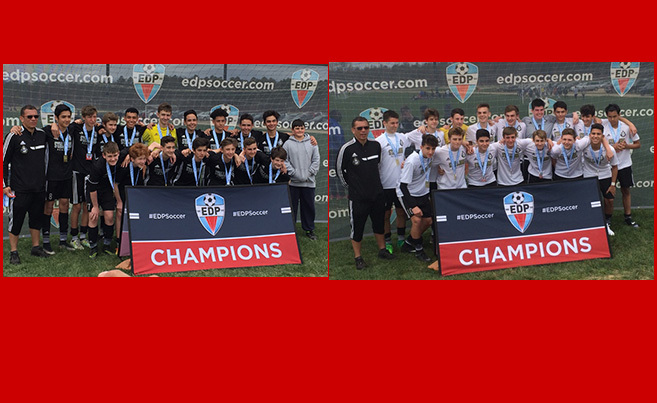 The U16B NJ Stallions 01 EDP team won handily in their division over 4 strong regional teams, completing four (4) shutout victories, scoring 13 goals over 4 games including the final. With this tournament win the U15B Bayern team rise to #5 State Rank in NJ, while the U16B NJ Stallions 01 EDP team also climb into the top 40 best teams in the state. Congrats to coach Jimmy and all the players on both teams on an outstanding weekend.